Tributes have been paid to Former Northern Ireland and Wolves forward Derek Dougan who died in England at the weekend, aged 69. Nicknamed the Doog, he was an advocate for an all-Ireland football team and an outspoken chairman of the Professional Footballers' Association. Former team mate Terry Neill said Dougan was a "colourful character". "There was never a dull moment when he was around and he was never short of a word or opinion," he said. "But in some ways that overshadowed his ability as a footballer because he was a great centre forward." After he retired, Dougan was involved in a diverse range of projects including standing as an independent candidate against sitting east Belfast MP Peter Robinson in a parliamentary election. 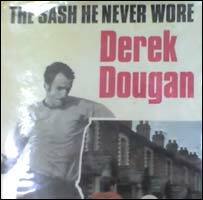 He was also a newspaper columnist and wrote an autobiography entitled The Sash He Never Wore. 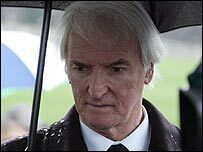 Dougan was a friend of George Best's and carried his coffin at the former Manchester United star's funeral in December 2005. On Monday, east Belfast MLA Robin Newton said he was "a fine ambassador for the game". "There are many who will remember Derek for his international career and no doubt feel sad at this time," he said. Dougan scored over 120 goals for Wolverhampton Wanderers and was in their victorious 1974 League Cup side. He won 43 international caps and before joining Wolves played for Portsmouth, Blackburn Rovers, Aston Villa, Peterborough United and Leicester City.